Prime Minister Justin Trudeau urged international leaders to do more to promote women's rights, including confronting widespread concerns over sexual misconduct and assault, on the main stage at the World Economic Forum in Davos, Switzerland on Tuesday. Prime Minister Justin Trudeau urged international leaders to do more to promote women's rights, including confronting widespread concerns over sexual misconduct and assault, on the main stage at the World Economic Forum in Davos, Switzerland, on Tuesday. Approximately 1,000 people lined up to listen to Trudeau's speech. "#MeToo, Time's Up, the Women's March, these movements tell us that we need to have a critical discussion on women's rights, equality and the power dynamics of gender," he said. "Sexual harassment, for example — in business and in government — is a systemic problem and it is unacceptable. As leaders, we need to act to show that truly, time is up." "Not just because it's the right thing to do, or the nice thing to do, but because it's the smart thing to do," he said. Trudeau said there's strong evidence that doing so would boost profitability and a country's gross domestic product. The president and CEO of ABB group, a multinational corporation specializing in robotics and automation, agrees. "Look, if you take our Canadian team, it's led by a lady, Nathalie Pilon. She's doing a fantastic job and we got a great level of diversity there. And all empirical study basically shows that management teams that have a good diversity perform better," said Ulrich Spiesshofer. Trudeau pushed the idea of gender-balanced boards and project teams, while touting Canada's own efforts to help women, including the Canada Child Benefit and expanded parental leave options. He also promised pay equity legislation for federally regulated employees would come this year. But former Liberal cabinet minister John Manley says Canada has a lot of work still to do, especially in corporate boardrooms. "We're doing better but we're not great," said Manley, who is now president of the Business Council of Canada, adding that the World Economic Forum has looked at the issue, globally. "The corporations who are members of this august organization apparently aren't doing that well either." The forum itself has been criticized for it's low proportion of female delegates. Fewer than 25 per cent of the people attending Davos are women. 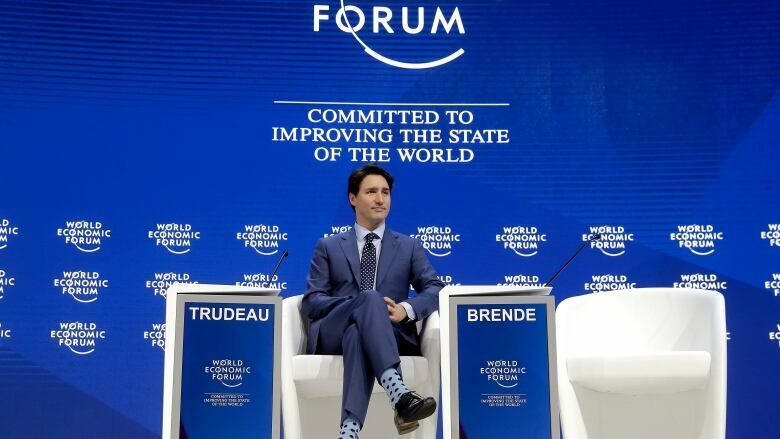 Trudeau's address also strongly chastised the world's corporations and governments for becoming disconnected from the common person. "The unrest we've witnessed is driven by anxiety and fear — fear of what a rapidly changing world means for workers and their families, and for those who are already struggling in the existing economy. And that fear – that anxiety – is valid," he said. Trudeau urged businesses and governments to ensure that the benefits of economic growth are shared widely. "We cannot neglect our responsibility to the people who matter most, to the people who aren't here in Davos and never will be," he said. Membership to the forum costs tens of thousands of dollars. "Do we want to live in a world where the wealthy hide in their gated enclaves, while those around them struggle? Or do we want to help create a world grounded in the notion of fairness?" "Because right now, we are in real danger of leading to our kids a world that is less fair than the one we inherited from her parents."